VLP Therapeutics’ i-αVLP (inserted alphavirus VLP) platform can deliver substantial amounts of antigen on the surface of a virus in order to stimulate the body to produce specific disease-fighting antibodies. 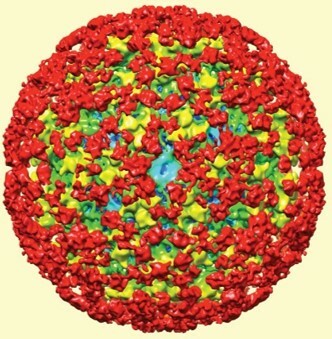 The i-αVLP platform displays rationally designed, disease-targeting epitopes on the surface of two highly effective alphaviruses (Chikungunya and Venezuelan Equine Encephalitis). Our lead i-αVLP vaccine candidate is an IND-ready malaria vaccine which is scheduled to enter into a Phase I/IIa human trial in 2018. The i-αVLP platform has also demonstrated in preclinical studies its ability to target immune checkpoint inhibitors (PD-1, PD-L1) and other novel immune checkpoint molecules and cancer stem cells. The immune system is a biological structure that works to protect against disease. The human immune system detects foreign objects such as viruses, bacteria or abnormal own tissues (like cancer cells) in the body, and not only tries to eliminate these objects but memorizes them so it can protect the body from these objects in the future. Vaccines utilize such immune system to protect us from various diseases. Traditional vaccines are made using live viruses, which, though rare, cause serious safety issues. Unlike traditional vaccines, our novel, proprietary platform technology was created by utilizing virus like particles (VLPs). VLPs are identical to the authentic native viruses in their shapes, but do not carry any genetic material of native viruses. Without genetic material, VLPs cannot replicate themselves. This means that when presented to the body, immune system will recognize VLPs as foreign objects, triggering effective immune responses, but without causing the side effects associated with the native virus. With 240 copies of envelope protein per CHIKV VLP, each i-αVLP can display a tremendous 480 copies of an inserted antigen. This highly symmetrical, icosahedral dense array of antigens are shown to induce very strong immune responses, resulting in the superior efficacy. Unlike traditional vaccines, VLPs themselves are non-replicative because they do not carry any genetic material, and therefore are safe, having been used to make the FDA-approved vaccines for Hepatitis B virus and human papillomavirus. VLP Therapeutics has established a method to efficiently produce i-αVLPs which can be scaled for commercial production. Malaria remains one of the world’s most devastating infectious tropical diseases. It is caused by parasites of the plasmodium genus with transmission occurring from the bite of an infected mosquito to humans, resulting in high fevers, shaking chills, flu-like symptoms and anemia. After infection, the parasites (sporozoites) travel through the bloodstream to the liver, where they mature and are released as merozoites. The merozoites enter the bloodstream where they infect and multiply in red blood cells. The first symptoms usually appear 10 days to 4 weeks after infection and occur in cycles of 48 to 72 hours. Plasmodium falciparum (P. falciparum) is the most virulent strain, responsible for most malaria-associated deaths. In total, an estimated 3.3 billion people – both civilian and military — are at risk for malarial infection worldwide. According to the World Health Organization (WHO) and the Global Malaria Action Plan, malaria was estimated to cause 198 million clinical cases and 584,000 deaths in 2013. The most vulnerable populations consist of those with little or no immunity against the disease such as young children, pregnant women and travelers. The impact of malaria in endemic nations is so widespread that malaria-endemic nations face an economic growth penalty by up to 1.3% annually, stemming from lost worker productivity, suboptimal agricultural growth, discouragement in foreign investment and tourism, and impairment in childhood learning; all of these have been estimated to impact their Gross Domestic Product (GDP) by 5%-6%, chronically impeding these nations’ abilities to flourish. Protection against malarial infection has primarily been achieved through personal protective measures, vector control, and chemoprophylaxis. While the short-term protection and treatment rates provided by chemoprophylactics and ACTs can be effective, the emergence of drug-resistant strains to the drugs are pressing the need for more effective, durable measures such as vaccines. As the malaria parasite has a complex life cycle with expressed in multiple stages in humans and mosquitoes, vaccine development has been challenging. The ideal malaria vaccine would induce sterile immunity by blocking early stage transmission from mosquitoes to humans. Utilizing i-αVLP platform technology, we have developed VLPM01, a pre-erythrocytic vaccine that targets the CSP antigen of P. falciparum sporozoites. VLPM-01 has shown very potent efficacy in pre-clinical studies and is expected to enter into Phase I/IIa clinical trial in 2018. Copyright © VLP Therapeutics. All Rights Reserved.